If you are a hunter and have never hunted a Maine black bear, you might want to give it a try. Since the hunting of bears is the only practical way to control and manage bear numbers, the challenge for the wildlife managers is to expand hunt opportunities in a way that will increase the annual harvest. This is easier said than done. Unless Maine adopts a spring bear hunt, or more hunters take up bear hunting, Maine’s bear population is likely to continue upward. Some things you should know: 1) Bear meat, contrary to the myth, is excellent table fare if properly handled and processed. 2) Hunting bear over bait is not a slam dunk as many, who have never tried it, would have you believe. Bears are smart, wary critters and, for the hunter, patience, stealth and cool-headed marksmanship are still prerequisites of a successful hunt. 3) The majority of Maine citizens, contrary to the popular myth, are not opposed to bear hunting as a recreational sport. Surveys indicate that 84 percent of Mainers approve of bear hunting. It’s not too late. You can either contact a Maine bear guide (the Northwoods Sporting Journal is a good source for bear guides) or you can undertake your own unguided bear hunt. Time is of the essence. Get permission from a landowner to set up a bait site and a tree stand. Most bear guides I know won’t tell you where to hunt, but they will give you free advice on how to concoct bear baits from store-bought products. You need to start baiting in early August well before the late-August opening of bear season. Put your bait in industrial-size trash bags. Hang the bait from a sapling within shooting distance of your tree stand. A nearby trail camera is a good way to get a feel for the feeding bruin’s habits. On opening day, climb into your stand well before dark. Be as still, quiet and scent-free as you can and wait for the action. Seeing your first black bear suddenly materialize from the shadows of the fir thicket as the sun drops on the horizon is a real heart-stopper, however the hunt turns out. 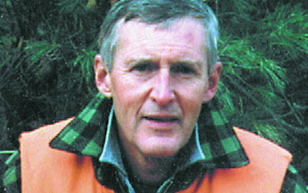 V. Paul Reynolds is editor of the Northwoods Sporting Journal. He is also a Maine guide and host of a weekly radio program, “Maine Outdoors,” heard at 7 p.m. Sundays on The Voice of Maine News-Talk Network. He has authored three books; online purchase information is available at www.maineoutdoorpublications.com.